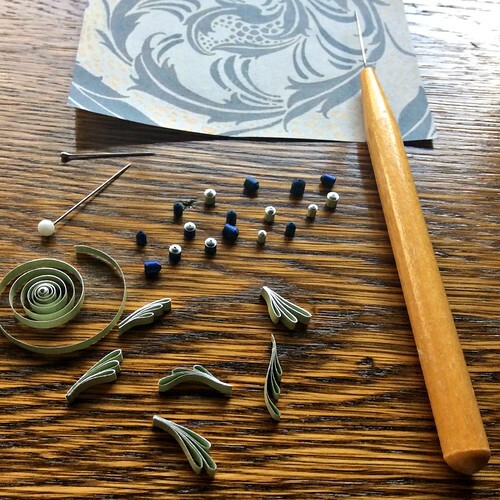 A few years ago a friend asked me to quill a birthday gift for her husband who is a paper conservator; thus, he's quite familiar with quilling and its long history. You might remember the distelfink I made for him. 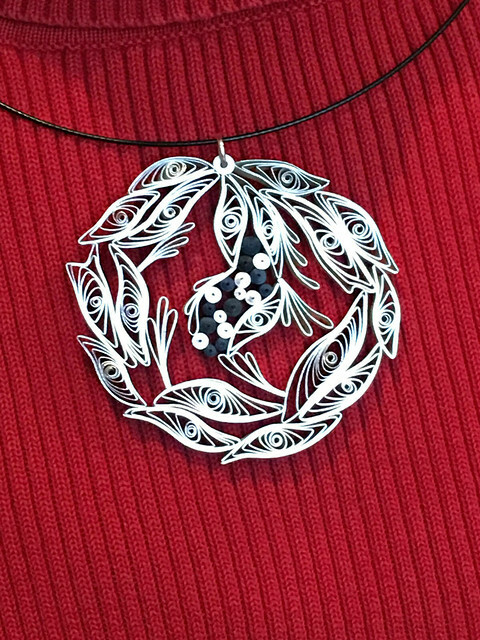 Fast forward to this past fall... we met for dinner and both admired a quilled pendant I was wearing... later he contacted me with ideas for a new design that wanted to give his wife. He told me he had studied the quilled bird and jewelry designs on my blog to get a sense of the forms that are possible and sent several textile images to show what he had in mind. We decided on one by Arthur Silver that has an art nouveau look with elongated leaves and shapes. Silver-edged green paper was requested... I chose my favorite soft (moss) green from JJ Quilling Design. He especially liked the whiplash feel of the design with its energy playing among curves and counter-curves and so I tried my best to capture movement. For the domed tight coils in the center, I used a mix of navy, metallic navy (looks black on edge), silver edge deep blue, and silver edge moss green. 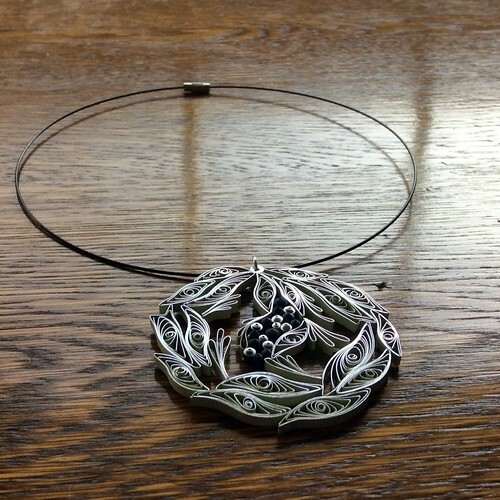 The completed pendant measures about 2.5 inches in diameter and has a brilliant shine when it catches the light. I had a good time making a folded paper box (once again, I used this origami box tutorial via The Paper Assembly) and gift card, and mailed everything to him in a plain brown wrapper. Ha, not really... but enjoying my role as Secret Santa, I used a sturdy box, typed the address label instead of my recognizable handwriting, and left off a return address so the surprise could be kept until the 25th. Originally I had thought I would need to mount the pendant on paper, but after a good bit of rearranging, was able to connect all of the coils to create a rigid piece. I was glad about this as I prefer a see-through design to show off the lacy coils. Our friends emailed the above photo on Christmas Day... how gratifying to hear back so quickly that she liked it! One more item to mention: Paper artist Helen Hiebert asked me to let you all know about her online class that will launch in early March. Paper Illuminated: Innovative Structures Featuring Paper and Light [edit: link no longer active] looks great... you'll be able to experience one of Helen's popular classes from the comfort of home. Click the link to view the trailer and sign up by February 1 to receive early bird pricing. I'm curious how pieces like this hold up. Do you do something to them to preserve them or are they just paper that people need to be cautious to keep relatively dry? Jacquilynne, I caution people to treat my paper jewelry as they would any fine jewelry... last thing on, first thing off, and store it in a protected place. It is just beautiful. I never had seen anything like this! What a creative imagination and talent you have! Thanks Alicia, that's so kind of you to say. I would never have thought to do it without the illustration... that kind of inspiration helps so much. Beautiful! You don't spray it with something to protect it? Thanks Lisa! The moisture in many fixatives makes the coil centers swell... not a good look. 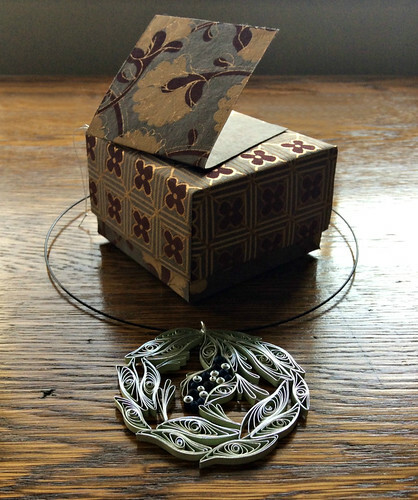 And honestly, paper pendants and earrings don't get much abuse when worn, so I don't find it necessary to spray them. Paper rings or bracelets would need protection though.